19th century Chinese painting. This image is part of a larger set that shows scenes of a gentry led militia in training. Note the individual in the foreground with long pointed hudiedao. Special thanks to Gavin Nugent (www.swordsantiqueweapons.com) for sharing these images. It is very hard to pierce the veil of the mid-19th century and to understand what exactly was happening in the development of the popular martial arts between about 1820 and 1880. This is particularly true in areas that suffered a great deal of social disturbance during the 19th century like Guangdong (and many other places as well). The wall of silence is all the more disconcerting as it seems that lots of interesting stuff was happening. If you go back as far as the late 18th century only a few of the modern Chinese martial arts styles existed in a recognizable form. Yet by the late 19th century, exactly 100 years later, the groundwork was fully in place for the modern martial arts explosion that would happen in the 20th century. So what exactly happened in this critical 100 year period? We just don’t have all the answers. Part of the problem is the Chinese historical record itself. Social elites did not record a lot of information on boxing and pole fighting, and “everyone knows” that most martial artists of the period were illiterate and operated only within the confines of an oral culture (more on this historical assumption later in the post). When you combine that with the massive purging of records, documents and histories that happened in the Opium Wars, the Taiping Rebellion, the 1911-1912 Revolution, the years of warlordism in the 1920s, the Japanese invasion during the late 1930s, the “Liberation” of 1949 and then again in the final fires of the Cultural Revolution…it is not hard to understand why a country with as much history as China seems to have so little of it left lying around. The modern mania for ripping down historic neighborhoods to build ever widening rings of largely empty high-rise apartment buildings has not helped matters. It is not all darkness; valuable sources have survived. Yet scholars and amateur historians would like to see more. One of the important but often overlooked resources that we do have at our disposal are foreign language resources. In this case the foreign languages that we are interested in are English, Japanese, French and German. Of course these are the tongues of the major colonial powers that were starting to encroach on China in the mid-19th century. Still, interesting accounts can be found in each of these literatures. Merchants, soldiers, missionaries and the occasional adventurer traveled to China in great numbers during the late imperial period. They left a number of reports, accounts, memos and memoirs in their wake, all of which are available in any well-stocked research library. Better yet, lots of these works are being scanned and digitized en mass, making even the trip to the library unnecessary. There are obvious problems with this information. The authors, almost without exception, were not trained historians. In some cases they weren’t even very good social observers. The usefulness and accuracy of different accounts can vary tremendously, and many of these works are written with a clear agenda that is not favorable to the Chinese. I actually find many of the accounts left by German Catholic missionaries so offensive as to be almost unreadable. Still, there are gems in the rough, and they occur with enough frequency to justify familiarizing yourself with the sources. For instance, a lot of the earliest and best writing on Qiu Jin, the female revolutionary martial artist and poet I discussed a few months ago, was written in Japanese. My language background is actually primarily in Japanese so I and a Japanese graduate student spent a few hours a week over the course of a semester reading these sources to familiarize ourselves with her life. These foreign language resources can be quite valuable, and in many cases they are the oldest first-hand accounts that exist in any language. All authors have a certain bias in how they see the world, and these sources are far from unbiased. Yet their preconceptions are different from elite-produced Chinese history, and hence they often provide a different perspective, or record different types of data, that modern historians find helpful. To help familiarize readers with what is out there I am going to review two or three of them over the next couple of months. Hopefully we will be able to introduce the source, discuss its value to scholars today and apply it to a current historical or cultural problem in the area of Chinese martial studies. Wood block cuts illustrating unarmed Boxing form the “Nobel Art of Self Defense.” (circa 1870). Note that the individual on the left is striking a boney target (his opponent’s face) with an open hand, where as the “figure A” on the left is now attacking a soft target with a closed fist. This is generally good advice and it is still taught in the southern Chinese martial arts today. 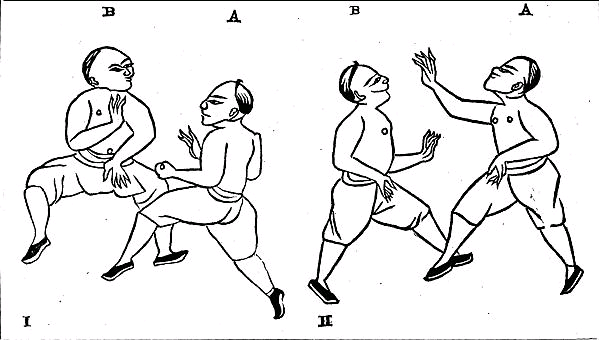 The Noble Art of Self-Defense: A Manual of Boxing and the Hudiedao Printed in the 1870s. The first foreign language source we review may be of general interest to everyone, and is of special interest to southern stylists, Wing Chun students and anyone who is concerned with the history of butterfly swords (hudiedao). It is particularly important in light of my previous study of the development and use of the hudiedo in Guangdong during the early 19th century. The September 1874 issue of the China Review ran a brief piece titled “The Noble Art of Self-Defense in China.” The article was published anonymously by an educated British gentleman who evidently had some interest in boxing and went by the initials L. C. P. The copyright on this material has long since expired so I have up-loaded a PDF that anyone can access by clicking the following link [ Noble Art of Self-Defense ]. It only takes about five minutes to read and is well worth the effort. “The Noble Art of Self-Defense” is also an extremely important text as it tells us quite a bit about an era of martial arts manuals and authorship that we have very little information on. For instance, Brian Kennedy and Elizabeth Guo, in their book Chinese Martial Arts Training Manuals: A historical Survey (Blue Snake, 2005) lists five distinct eras of publishing on the martial arts in China. The current work fits nowhere in their larger framework (in their view printed martial arts manuals are a product of the Republic of China period). One could easily say that of course any typology will have a few exceptions, but that is not the case here. Rather we have collectively forgotten about an entire era of active martial arts related publishing and commercial activity. L. C. P. not only describes this booklet but he situates it within a surprisingly rich social context of marketplace vendors, soldiers, opera singers and public commercial martial arts instructors (something else that is often ascribed only to a much later period). It is clear from his descriptions that already in the 1870s printed martial arts manuals were not horribly rare. Instead they were a cheap and common good in large southern Chinese market places. Yet we have been unaware of the existence of these works because literally not one example has survived to the present day (at least that I am aware of). The lasting value of “The Noble Art of Defense” is to document this aspect of the Chinese language literature and suggest that even marginally literate martial artists may have been buying and producing cheap “penny-books” during the late Qing dynasty. Given the popularity of cheaply printed martial arts fiction during this same period the existence of mass produced training manuals probably should not surprise us, and yet it does. (For a discussion of early martial arts novels in southern China see John Christopher Hamm. Paper Swordsmen. University of Hawaii Press. 2006. Focus especially on his discussion of the “Old Guangdong” school of fiction). L.C.P.’s tone towards the local Chinese population is not always positive, but overall he seems to be a sympathetic and interested observer. He also felt that his own people (the British) were capable of doing some pretty stupid things in the name of cultural superiority (like wearing woolen suits in the tropics). He clearly felt that some of their systematic misconception of what it meant to be Chinese (e.g., that the Chinese were by definition backwards) needed to be corrected. In confronting these attitudes he notes that while the Chinese do things differently, many of the problems that they face are identical to those seen in Europe and their solutions are often uncannily similar. To paraphrase the late anthropologist Ruth Benedict, the “arc of human potential” is not nearly as broad as we sometimes imagine, and a little sympathy can go a long way towards understanding something that on the surface may look very different. Nevertheless, his observations of Chinese society are not without a certain bias. L. C. P. passed harsh judgment on the Chinese military in Guangzhou (Canton). He found their continuing fascination with boxing and “cold weapons” in the 1870s, well after they should have moved on “to something more useful and wholesome” like the Martini Henry Rifle, disturbing. In all fairness a lot of Chinese intellectuals and local leaders at the time agreed with him. Yet his observations in this area introduce us to our first point of discussion. L.C.P. and his anonymous friend were interested enough in the “arts of self-defense” that they visited soldiers, martial artists, bought and translated popular publications, and had a fair understanding of how the lower classes of martial arts teachers and students actually worked. Yet in L. C. P.’s mind “boxing” was a sporting endeavor and he appears at times genuinely confused that it was not pursued as such in China. A very interesting painting from the previous series. 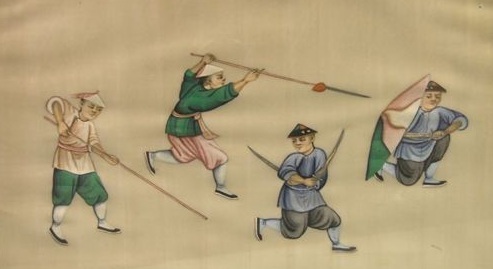 Note that this one shows individuals with clearly rendered Hudiedao, Shuang Jian and Shuang Dao, suggesting the practical use of all three weapons. Special thanks to Gavin Nugent (www.swordsantiqueweapons.com) for agreeing to share this image. Talking about the nature of the Chinese people he notes, unlike the British, they don’t seem to view street fights (as opposed to challenge matches on a raised stage) as a type of popular entertainment. When someone is insulted at the docks, rather than a fight breaking out (which is really a form of cheap entertainment for the workers back in the UK) Chinese employees will just keep on working. And if, after continued goading and abuse, a fight does break out, rather than the sort of orderly amateur boxing that he sees in Europe, the contestants are much more likely to pick up poles, bricks or other weapons in an attempt to actually kill one another. I find this moment of culture shock very informative. I think it reveals quite a bit about street culture in Guangzhou versus London. Both could be dangerous places in the late 19th century, and both certainly had a specter of violence hanging over them. But that specter didn’t take the same form in each city. A certain type of British street violence was more common, but also more socially regulated. It was hemmed in by a number of universally understood norms precisely because it was tolerated and normalized at some level. Violence in southern China was less common, and because it lay outside the realm of the accepted social order, it was subject to fewer specific norms and restraints. The eruption of open public violence was pretty rare, and when it did come it took the form of private war, between individuals, brotherhoods and clans. Right away we see a serious misunderstanding of what “self-defense” really implies. One suspects that if a British gentleman from the more rough and tumble 16th or 17th centuries had been exposed to this material they may have found its aims less perplexing. 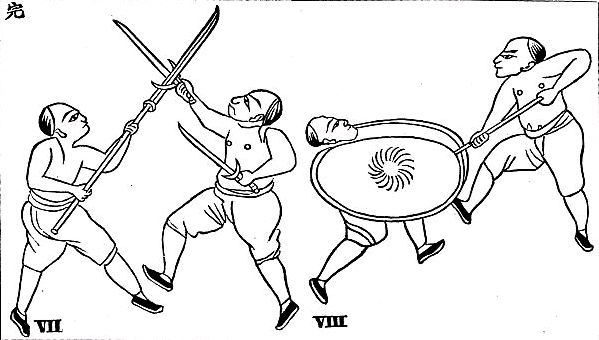 Hudiedao (Butterfly Swords) in the 1870s: Understanding the Southern Chinese Martial Arts of Leung Jan’s generation. The main body of the article proceeds with a partial translation and commentary on a short publication, or pamphlet, on the southern Chinese martial arts. A direct translation of its title reads “The Noble Art of Self-Defense” (unfortunately the author does not provide the original characters). No author was listed. The publication was printed in Canton and was exported to Hong Kong for sale, which is where the author encountered it. We don’t know specifically when the book was printed or first written except that it must have been sometime before the summer of 1874. For Wing Chun students the 1870s is a particularly important time. Leung Jan was still alive and instructing Chan Wah Shun, who had not yet begun to teach. While Wong Wah Bo and Leung Yee Tai had already moved on, it is probably in the 1860s and 1870s that the modern synthesis of southern boxing that we now think of as Wing Chun really comes together and gels as a distinct art. An account describing the general martial milieu of places like Guangzhou and Hong Kong during this decade is very important. In total the “book” translated by L. C. P. was only about ten pages long. 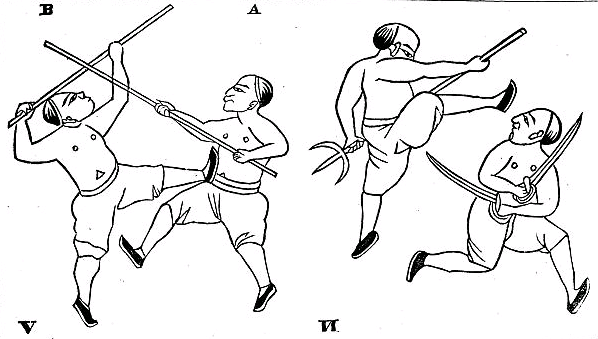 Each page of the pamphlet featured a woodblock print of two martial artists fighting in two different positions. The text provided by the original Chinese author was extremely brief and described only the actions of the combatants and the names of postures. The structure of the book is similar to the illustrated techniques found in what Patrick McCarthy (2008) has labeled the “fourth section” of the Bubishi. This resemblance is important as the Bubishi itself was a more complex martial arts manual exported from southern China to Okinawa in the early 1800s. While normally venerated by Karate students, it is an important point of comparison as it is the most sophisticated surviving southern Chinese martial arts training manual that has been published and made widely available. The layout of this small book reflects the priorities and practices of martial artists along the Pearl River at that point in time. Much to the disappointment of L. C. P., the Chinese “arts of defense” did not seem to center around boxing. Only the first two leaves of the collection dealt directly with unarmed fighters. The next three pages turned their attention to pole fighting. Interestingly the English author immediately interpreted these “lessons” as being similar to the old English tradition of quarterstaff fighting and felt himself in known territory. The last seven pages of the manual focused instead on “cold weapons” including tridents, spears, long handled choppers and two different sorts of double sword combinations. In fact, six of the remaining seven pages were dedicated to engagements between one opponent with double swords and another armed with a longer pole weapon. 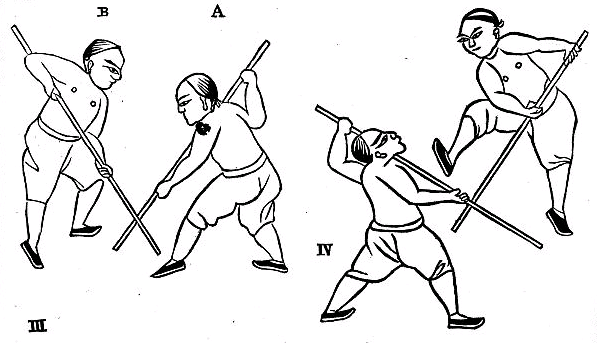 Of course the spear and hudiedao were the main weapons issued to peasant-soldiers in this region from the 1830s-1860s. We know that literally thousands (probably tens of thousands) of men received formal instruction in these weapons as they participated in gentry led militias. Poles and butterfly swords are also the only weapons taught in Wing Chun. Given the historical circumstances surrounding the arts development, we should not be too surprised by this. Further, the “Noble Art of Self Defense” makes it clear that these same issues were still critical area martial artists in the 1870s. The swords that are portrayed in the woodcuts differ from those that are used by martial artists today, but are quite similar to antique blades in private collections that were manufactured during the 19th century. Two types of double swords are seen in the text. The first has a narrow blade that comes to a sharp point. While slightly curved it is still an effective stabbing weapon. The grip is enclosed in some type of hand-guard and the blade (if the proportions of the illustration are even close to accurate) is probably about 60 cm long. These blades resemble a pair of naval cutlasses or small hangers. 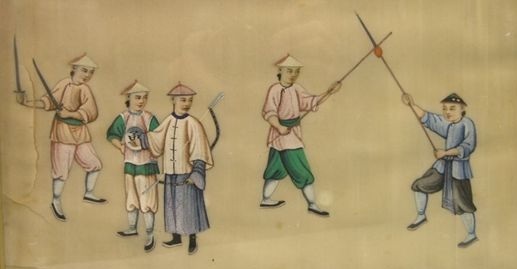 In short, the illustration shows typical 19th century hudiedao. The second pair of swords are slightly different. Their blades appear to be a bit straighter and shorter. In terms of their size they seem similar to the short swords that were popular among criminals and gamblers in the coastal cities of China. These were the weapons that the ‘Short Sword Revolt’ was named for (another uprising in which opera singers in full costume played a notable role). The hilts raise some questions. One appears to be a simple metal upward facing half-moon, of the type commonly seen on the sorts of weapons that village blacksmiths might produce. The other cross-piece is more distinct and the fighter appears to be trying to trap a large chopping blade with it. Once “bridged,” the opponent’s weapon will be safely encumbered, and the defender can then counter-attack with his reserve sword. Note the attempt to trap the opponents Pu Dap (Horse Knife) with the quillion of the shuang dao. Many Wing Chun weapons schools still show a perplexing enthusiasm for this exact movement. I personally share L. C. P.’s extreme skepticism on the matter. My own school has a fairly heavy emphasis on weapons training including full contact fencing and sparring. We have looked at this problem extensively. It is just not possible to trap a blade of any length, let alone a pole arm, safely in this way. It really is suicidal. The fact that these movements cannot be carried out successfully against a skilled and determined opponent have nothing to do with skill, it is a matter of geometry and the principal of leverage. It has always been a puzzle to me that this particular technique has persisted in the lore of Wing Chun for so long. I suppose it exists because in the modern era very few students are ever allowed to learn the swords, few schools actually approach them as a style of serious fencing, and fewer still take the time to work them against longer swords and pole arms in realistic combative situations. These woodblock prints, and L.C.P.’s commentary on them, are interesting as they imply that the question of trapping an enemy’s weapon with a quillion did not emerge in a single specific style. This is actually not an issue that is unique to Wing Chun. It was a more general idea that was shared widely throughout the region. Apparently it has also been puzzling martial arts students for quite some time. While double swords were popular in Guangdong during the 19th century, neither style of blades featured in this work resemble the “bat cham do” seen in modern Wing Chun schools. In both cases the blades are longer, slimmer and more suited for stabbing. A consensus is growing that the modern type of butterfly sword did not develop until the 20th century, and so we should not be surprised to see longer, more serious swords, being employed in the 1870s. Another image in the same series of paintings. Note the leader of this unit is dressed as a member of the gentry and carries a bow. Thanks again to Gavin Nugent (www.swordsantiqueweapons.com) for sharing this image. Conclusion: Literacy and Reading Strategies in the 19th century Southern Chinese Martial Arts. The British printers did an admirable job of reproducing the wood cuts from the original manual. Figure B in the first frame of Print I is about to respond to a low punch with a typical high-low guan. It all looks very familiar, except for his stance which is much deeper than modern Wing Chun. It may just be me, but the figure also seems to resemble one from General Qi Jiguang’s “32 Forms.” His figure also holds his hands in this position, yet his stance is not quite so deep and is walking forward. All of which brings up the question of authorship and literary dependency. While L.C.P. notes that the “arts of self-defense” are taught primarily through oral means in both the UK and China, he does observe that Chinese books on these topics are more common than European ones and that they appear to be widely distributed. The most popular ones are short manuals like his that can be bought for less than a penny at a stall in the local marketplace. They tend to not impart much knowledge and their overall quality is not what one might hope for given their large readership. Better, more comprehensive, books are available, but to get them you have to have money and you must visit a real bookshop. They cannot be found as simply and easily. This is a fascinating revelation. We tend to think of the traditional martial arts in China as being a wholly oral realm, and yet we discover that not only is there an elite literature, but that there is a vast popular literature as well. Sadly almost none of these popular publications survive today. If not for the accounts of L.C.P. we probably wouldn’t know anything about them. Given the abundant pictures and simple, direct commentary, a reader did not have to be fully literate to understand “The Nobel Art of Self Defense.” And its price point would seem to indicate that this item was meant to be an impulse purchase. This is interesting because the existence of such a market would indicate that ideas might spread a good deal farther and faster within the martial arts community than if it were relying on the spoken word and teacher-student relationships alone. Such a market would also provide a way in which the insights of the more erudite literature might be disseminated, albeit in a simplified and watered-down form. L.C.P. is acutely aware of the shortcomings of this sort of literature. Set piece defenses only work against carefully scripted attack sequences, and if the opponent deviates from the script the technique is useless. One could raise this same complaint about 70% of all of the articles ever published in Blackbelt Magazine and they would be just as valid. It seems that some things in the martial arts never do change. It is also notable that he links this sort of set-piece attack and defense to the sorts of martial arts seen in Cantonese Opera and being performed by martial arts masters in the market place. There is probably a lot of truth to his observation that in the early 1870s Guangzhou and Hong Kong were full of martial arts teachers precisely because there were a lot of unemployed opera singers (due to the ban on the art following the Red Turban Revolt). Once again, Wing Chun students won’t have too much trouble seeing where figures like Wong Wah Bo and Leung Yee Tai fit into the local landscape that L.C.P. describes. Perhaps I am too quick to bestow the benefit of the doubt, but I wonder if we are missing something when we think about this training manual and those like it. We know that workers from the countryside tended to be the most interested in the martial arts and to have had the most experience with them. True, a penny was not a lot of money, but for working class individuals it was not trivial either. Given their almost universal prior militia experience one would think that martial artists in the 1870s would be able to judge the value of a work like this. Rather than portraying set piece defenses and sequences of movement, perhaps this book is really just a primer that lists a number of postures. The individual martial artist is then left to fill in the correct sequence of movement and give them the correct energy. The postures in the book and short inscriptions act as a mnemonic device. After all, that’s basically what Qi Jiguang was doing with his “32 Forms.” You had to be an experienced martial artist to read his book and get anything out of it. Perhaps the “20 Forms” reviewed by the current author were the same thing, a useful aid to memory for those who already knew, and a useless puzzle to a curious British boxing fan. If this is indeed the case than L. C. P. might be the first western martial seeker to discover that you can’t learn Kung Fu from a book. The “arc of human potential” means that some things are just never going to change. Ben, again a wonderful article that will invoke discussion. The stated aim is noble and at the same time a concern as you then note in the next passage. I do wonder if the images within the manual shouldn’t be treated as contact rather than stop and control. The guard could be as easily represented as catching the long handle rather than a romantic catching of the blade. One can sense with contact and touch to develop a better martial position rather than catch, absorb and counter. If one did catch the blade and guard made contact with guard and “locked”, the longer weapon would still have leverage as you not and control and distance from the defender with the double swords. Also, by design of the image it would expect a practitioner to have a weapon shaped as that one is which would not be true in many instances of those the manual was initially developed for. Perhaps the page is “This is something you shouldn’t do rather than a try this”??? Thanks for stopping by. Yeah, I think that you are correct that there may be more charitable interpretations of that illustration. I basically followed L.C.P.’s line of thought. But there can be a lot of value in contacting a blade (if you have two blades) besides just trapping it with the quillion. Consider the second painting for example. I think what is about to happen is the spear guy is about to thrust at the hudiedo guy’s face. He si going to push forward with an inverted guard with the left sword as he steps with the left foot. This mean his sword will contact the weapon, but rather than locking with it, it will push it away and to the left as he advances and moves inside its tip. He can then tap his training partner with the reserve sword held high in his right hand. At least that is my reconstruction of what is going on in that painting. As to your last point, yeah it certainly could be a “don’t do this” illustration. Thinking back to the similar illustrations in the Bubishi for a moment, they all seem to involve one person doing something (sort of like making a mistake) and the other capitalizing on it. What do you make of the similar figure with the two swords, arms crossed, while looking back in both the paintings and the prints. I was surprised to see the two figures in exactly the same pose. Sort of leads one to suspect that it was not a fluke? Excellent writing and analysis. Thank you for this contribution. This manual is absolutely awesome! I really enjoyed reading this. So interesting! Thanks for sharing! “Noble Art of Self Defense” might not be the English translation of any Chinese term at all; the term is very common in English-language works from the 16th to the 18th (and perhaps 19th centuries), and normally referred to a rather nationalistic concept of “English” martial arts such as English boxing, folk wrestling, quarterstaff, and English broadsword/backsword/sabre play (in contrast to styles of swordplay imported from the Continent, although even the “native” English styles almost always displayed some degree of Continental influence from the earliest records we have, with the possible exception of the nearly indecipherable medieval longsword texts). Undoubtedly you are correct about the popularity and origin of this term. And as I mentioned in the post LCP didn’t provide the original title in Chinese so we have no way to check his assertion. But it is interesting that he is not alone in this usage. A number of English language sources and dictionaries from this period use the “self-defence” construction when talking about what we would now call the Chinese martial arts. So if anyone is looking for older accounts of the subject, that is one of the search terms they should keep in mind. Thanks for dropping by.